For more Watery Wednesday photos, click here. For more One Single Impression poems with the theme “Grace,” click here. Posted on October 26, 2010, in my digital photos, my haiku, One Single Impression, Sensational Haiku Wednesday, Vancouver Island, Watery Wednesday. Bookmark the permalink. 17 Comments. Wonderful! The reflection suggests a vast universe. The puddle is small yet eternal. Simple, I found it needed to be enlarged to be fully appreciated. Lovely that you showed the connection between grace and things that live around us… you have to see the small things before you can see the big picture. Stick, alas – oh, well . . .
You know, if it wasn’t for the stick in the photo I would thought this was a large stream in a valley. such a wonderful piece, you got a sigh out of me. This just takes my breath away. Very spiritual. Wonderful place – Tofino and area are so magical. Great haiku! very nice photo. 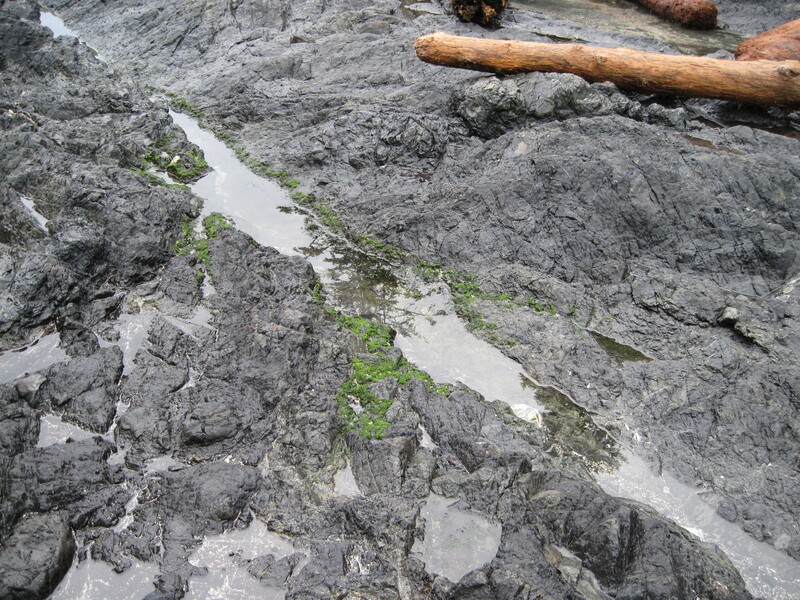 I love little tidal pools. You never know what you will find in there.